qTOWER³ | Tamar Laboratory Supplies LTD. Robust: Patented high performance optical system with an outstanding long-term warranty of 10 years! Vision, Amazement, Simplicity: the new qTOWER³ real-time PCR thermal cycler from Analytik Jena. The patented fiber optic shuttle system with unique light source powered by 4 high-performance LED’s guarantees ideal excitation and detection of known fluorescent dyes up to the dark red. In addition, the system’s highly sensitive detection module can be equipped with up to 6 different filter modules. Filter modules are upgradeable, allowing the system to benefit from future Analytik Jena developments. And, enjoy peace of mind knowing that the qTOWER³’s optical components are backed by an industry-leading 10-year warranty. Silver block technology is at the heart of the qTOWER³, offering outstanding control accuracy of only ±0.1 °C over the entire 96 well block. Optionally, the linear gradient function is the optimal tool to easily adjust the instrument to new assays. The qTOWER³ is available either as stand-alone device with integrated 10” tablet or as PC-based system. The software comes with a broad spectrum of optimized analysis algorithms including absolute and relative quantification, ddCt method, PCR efficiency, allelic discrimination, endpoint detection as well as melt point and protein analysis. In the field of quantitative real-time PCR a wide variety of fluorescent dyes with different characteristics are applicable. In order to optimally excite each of these dyes over a wide spectral range, a novel light source with four long-life LEDs in red, green, blue and white (RGBW) is used in qTOWER³. The RGBW-LED ensures best possible quantum yield of each dye in real-time PCR experiments. Highly sophisticated multiplex applications with up to 6 fluorescent-labeled probes from the blue to the near-infrared range are no challenge anymore. Fiber OpticSystem (FOS):The integrated shuttle system with 8 optical fibers ensures an extremely fast read-out of the entire 96 well plate in only 6 seconds – irrespective of the number of dyes to be measured. In addition, all components of the high-performance optics come with a 10-year long-term guarantee. Depending on the application qTOWER³’s Filter Module System can be freely configured and upgraded, to both intercalating and protein-binding dyes, as well as to hydrolysis (e.g. Taqman®) and hybridization (FRET) probes. The system is future-proof, being easily retrofitted on-site with additional Color, FRET or Protein Modules, and can thus be adapted to other fields of application at any time. All filter modules contain an optimized combination of excitation and emission filters which, in combination with the light source,enable the ideal detection of a multitude of commercially available fluorescent dyes. 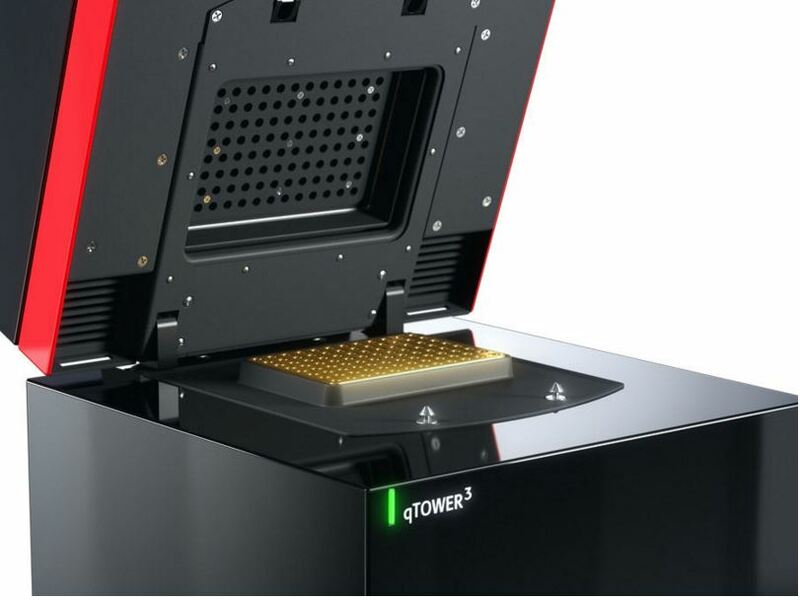 Basis for a reliable performance of quantitative real-time PCR in qTOWER³ is the sample block. To ensure best possible results and outstanding energy transfer into the sample, the thermal block is made of gold-coated silver serving much better physical properties than aluminum. As a result, the qTOWER³ is characterized by excellent temperature control accuracy of ±0.1 °C (over 96 wells) and first-class heating rates of up to 8 °C/sec. This combination makes the overall system the ultimate for any real-time PCR application. To guarantee the highest specificities for different assays, the device is available with a gradient function of up to 40 °C span over 12 columns. Rather than defining upper and lower temperatures as limits, the Linear Gradient Tool (LGT) allows to define simply the temperature increments as integer around the calculated annealing temperature of primers in a linear fashion thus making operation of the qTOWER³ simple and intuitive. To avoid condensation and the resulting loss of samples, the system is equipped with a motorized heated lid. This can be variably set up to 110 °C and guarantees, regardless of the consumables used an optimal contact pressure on the sample vessels during the entire real-time PCR run. The control and evaluation software qPCRsoft follows the concept that it should be flexible and user friendly. The logical arrangement of all tools, the intuitive handling and, last but not least, the parameter-oriented memory and programming design make the use of the software simple and clear. During an current run, the data from previous experiments can be evaluated in parallel without complication. In order to facilitate operation, a variety of steps, such as threshold calculation for determination of Ct-values or possible standard curves and PCR efficiencies are done automatically. Further evaluations such as absolute or relative quantifications as well as the ddCt-method (with or without relation to the PCR efficiency) can likewise be carried out automatically. qPCRsoft also includes algorithms for probe-based assays, allelic discrimination for e.g. determination of point mutations and the use of a positive/ negative analysis by endpoint analysis of the amplification plots. qTOWER³ can be optionally expanded with the aid of a through-and-through innovative operation concept. The qTOWER³ touch is a modern stand-alone system which renders the need of an external control system unnecessary. The integrated 10“ tablet leaves nothing to be desired with regard to experiment planning and implementation. The touch operation provides the user with a simple, intuitive menu navigation and both cycler programming as well as online monitoring and final Ct-value determination. The data files are compatible at all times with the comprehensive PC software and easily allow following evaluations. Regardless of whether it is qTOWER³ or qTOWER³ touch – the real-time PCR thermal cyclers from Analytik Jena are the ideal and reliable tool for everyday lab work. Regardless of whether it is qTOWER³ or qTOWER³ touch – the real-time PCR thermal cyclers from Analytik Jena are the ideal and reliable tool for everyday lab work. * The Color or FRET modules can be ordered separately. The qTOWER3 can be equipped with up to 6 modules.